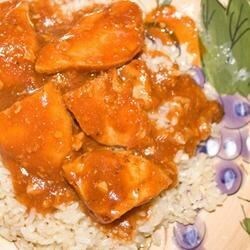 "Sweet, spicy, and flavored with Jack Daniels whiskey. Great on chicken and pork chops. I came up with this recipe after experimenting in my kitchen. Ketchup may be replaced by your favorite bottled barbeque sauce. You may have to adjust the ingredients to suit your taste. The key is adding just enough whiskey to flavor, not overpower, the dish." In a saucepan combine ketchup, steak sauce, garlic salt, liquid smoke, onion powder and brown sugar. Add lemon juice, pepper sauce, Worcestershire sauce and whiskey. Warm over medium low heat until simmering. Refrigerate for at least one hour before using, to let flavors mingle. Brush on meat during the last few minutes of grilling or baking. Not recommended for marinating unless you omit the lemon juice, as the acid makes the chicken grainy. We're the opposite of all of the other reviewers - this was too sweet for us! Slid off our bs chicken breasts while grilling too. Great flavors! We like it a bit sweeter, so I added 2 Tbsp. honey. Didn't have any Jack Daniels, so used Hieneken beer instead. Thank you Natalie for sharing this recipe. made as instructed; although i think i spilled a little more bourbon in the pot when i was measuring. i like it enough; but maybe i will leave out the hot sauce next time. thanks natalie! My wife said that this wasn't sweet enough, but I loved it. Next time I'll add more brown sugar if she's a good girl. Great sauce. It was a hit at my last dinner party. Spicy! I made this recipe recently; just did not add the liquid smoke as I did not have any. The recipe was good and a little zingy! Excellent on Kielbasa! Would definitely make this one again!